I don’t know how long it’s been since I’ve written one of these, so I’ll just tell what I’ve been doing the past few months. Most all my time has been consumed in physics and mathematics studies. I’ve spent a LOT of time with the Feynman lectures set, which is a 3 volume set. I’ve finished the first volume, and am maybe 3/4 through the 2nd volume. The first volume is mainly focused on mechanics, light radiation, and thermodynamics. The second volume is all electrodynamics and other studies in matter. The third volume, when I finally get to it, will be quantum physics, which I’m REALLY looking forward to. The volumes are pretty thick, and the material is REALLY technical. I’ve been spending maybe 6~8 hours per day on them, every day. They’re about as thick as college textbooks. Some chapters I have to go back and read several times – especially the ones on relativity. I’ve read Einstein’s book on relativity several times over, and also read the chapters on it in both my physics textbooks, and my Feynman lectures set, and still am working on fully understanding it. Yesterday I spent 10 hours doing nothing by relativity related experiments, trying to figure it out. Doing various thought experiments on paper, and doing the calculations. I think I’ve read Einstein’s book on relativity four times now, and each time I read it, I notice something profound which I didn’t catch the previous reading. Let’s go through one example he gives. This is so simple, yet profound. So subtle yet its complications and ramifications so immense. Listen carefully. First Einstein goes into the basis of geometry, and how it’s based on your frame of reference. Here’s the example he uses in his book. 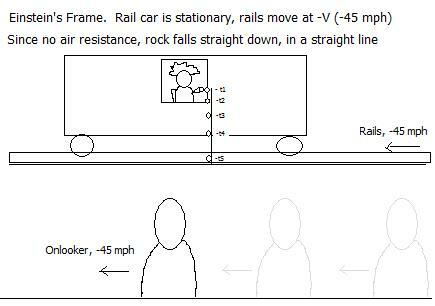 He’s riding in a railway carriage, moving down the tracks at a velocity V (Say, 45 mph). He sits in a chair riding in the railway car, while another man stands on the ground watching the railway car drive by. Einstein grabs a small rock out of his pocket, and drops it out the window. He assumes there’s no air, which means there’s no air resistance. Now if there wasn’t air resistance, and Einstein decided to peek out the window and watch the rock fall, it would drop straight down toward the Earth, in a straight line. But how do things look for the man watching from the ground? He would watch Einstein drop the rock, and the rock would not fall in a straight line, but would actually follow a parabolic arc. A curve. I decided to give you all some of my beautiful illustrations, whipped up in MS Paint, in like 5 minutes, haha. When I first saw illustrations like this in my physics books, I found them confusing. The thing is, you have to use a little imagination. The drawings aren’t completely accurate. They’re fine for low speeds, but if you were to approach the speed of light there would be warpings and distortions that could only be illustrated in first person. For the first drawing, imagine you’re looking out of Einstein’s eyes, out the window. The picture is drawn like you’re looking at the car from the outside, but I only did this because drawing a first person perspective would be more difficult. The second picture is closer to how it would look from the onlooker on the ground’s eyes. My curved trajectory is pretttyyyy crappy, and isn’t accurate, but bear with me. You’ll still be able to get the idea. Once again, imagine seeing this happen from the onlooker’s eyes, as Einstein drives by. Then Einstein points out that saying the rock has an absolute geometric trajectory is wrong thinking. It all depends on your reference frame, and how you’re moving relative to it. An object moving in a straight line to one person, is a curved trajectory to another person. That’s profound, if you actually get what he’s saying. Take Newtonian physics. One of its main concepts, coming originally from Galileo, is the law of inertia which says, “A body removed sufficiently far from other bodies continues in a state of rest or uniform motion in a straight line.” For example, say you’re out in outer space, throw a baseball, and there’s no planets or stars to pull on it by gravity. Newton tells us that the baseball is going to keep traveling in a straight line indefinitely through space, until some force acts on it, to change how it moves. 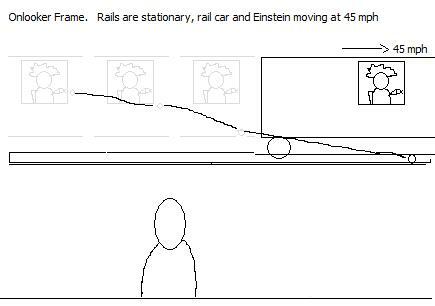 As the book goes on, using this same simple experiment of him riding around in this train car, he shows how all kinds of things in Newtonian physics are wrong. In his next thought experiment he has lightning bolts strike two ends on the railway at the “same” time. Then he asks us, “How would you know?” Then he shows that saying two things happen at the same time, without first specifying the reference frame, is wrong thinking. No two events happen absolutely at the same time. Events happen in different orders, depending on your reference frame, and how you’re moving. He then fully thinks out the consequences to this new style of thinking, and combines it with the conclusions of Maxwell’s equations which state that the speed of light is always the same, regardless of the reference frame, and next thing you know, you have questions like the “twin paradox”. Two twins are brothers, and born at the same time. As a young man, one of them shoots off into space at near the speed of light. He then does a loop around space and comes back. Once he returns, his twin brother is 95 years old, and only two minutes have gone by for him. As strange as it sounds, it’s how things work. And Einstein explains why all this is the case. The concept of “absolute distance”, as well as “absolute time” is wrong thinking. Distances “shrink” in the direction of motion, and time also “slows down”. First time I read this stuff, I was like… “WWWhhhhaattttt in the WOOORRLLDD…” But after spending months and months with it, hours and hours each day, I’m actually getting it. Now to say distances “shrink” in the direction of “motion”, and “time” “slows” down as well, sounds very confusing. But motion is all relative. For a distance to “shrink” we’re comparing one reference frame to another. Time slowing down is also comparing one reference frame to another. I love physics, I think more than anything. It’s as deep as you want to go. It’s unlike any subject I’ve ever studied. Like an infinite well of complications and problems that you can spend your entire life solving, and never run out of stuff to do. It’s just so awesome. I’ve learned a TONNNN of stuff. If you dropped me off back in 1785, with nothing but my math, physics, and engineering books, I could rebuild all kinds of the technology of today. I could go to a river, and construct my own hydroelectric power generator. I could build light bulbs, air conditioners, heaters, engines of all sorts, phones, water pumps, radio towers, electrical circuits, giant electro-magnets, hydraulic lifts, stereos, audio recording devices, and more. I just know how it all works now. I could LITERALLY build electric cars! I design me some electric driven carriage and cruise around. I could build telescopes and microscopes. Just amazing stuff. Later, when I study more, I could build aircraft, rockets, and laser cannons! With a bit more studying I could build an electric calculator, and with a lot of study, I could build a basic computer, though it’d be huge and bulky. I have no idea how to do nano-technology and microchips. I’m sure I could learn though. What’s amazing is this stuff isn’t THAT complicated. Once you get skilled in math, you can do anything. You see these same basic laws governing everything. I can just walk around outside and understand TONS of stuff. I know why the atmosphere is blue as opposed to any other color. I can tell you indepth about light polarization, and why the sky is red as the sun sets, and blue all the rest of the day, yet black at night. I can tell you all about rainbows, and even produce them with prisms. I can tell you why the different light waves refract like they do, and go into a huge discourse on dispersion of light waves. How can anything be more fascinating? There isn’t. I can tell you how stars and planets form, black holes, pulsars, white dwarves, nebulas, galaxies… Why certain elements are more prevelant than others. Why there’s tons of helium, hydrogen, and carbon, yet barely any of the rarer elements, like yttrium. (It’s all “star stuff”, compressed and made in stars, based on compressing of hydrogen and helium.) I can tell you why stars emit all this heat and light. I can show you how to determine the exact chemical makeup of a planet’s atmosphere from BILLIONS of miles away. I can’t believe sometimes that all this stuff is in books. Just go on Amazon.com and literally learn how to build anything. They’ll ship you whatever you want. And nowadays, half of this stuff can be downloaded from torrents and found in science ebooks! Other than that, I’ve been studying a lot of economics, and some history. I read a bunch of books by Murray Rothbard, a famous economist. Now I’m reading books by Nobel prize winning economist Fredrich Hayek. Right now I’m reading ‘The Road To Serfdom’, which is a book on the ups and downs of socialism (mostly downs), and why central planning always fails as opposed to free markets. He talks about the development of the Nazis, as well as Mussolini and Stalin, and how they got into power, and why. Then I see Obama socializing the country and think, “Here we go. Same old crap.” I read the New York Times today and see the same old arguments that people were saying back in 1930s and 1940s. Didn’t work then. It’s not going to work now. But Obama… He’s “brilliant”. How so? It’s sad to see history repeat itself. I’ll probably write up a huge entry on the “road to socialism”, and what we’ll see unfold throughout the process. Once again, it’s not complicated, but I don’t want to bulk up this entry any more.